By Peter Anderson 1 Comment - The content of this website often contains affiliate links and I may be compensated if you buy through those links (at no cost to you!). Learn more about how we make money. Last edited July 31, 2017 . 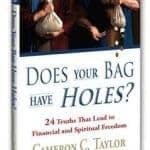 The following is an excerpt from a book I just read called “Does Your Bag Have Holes?. The book was sent to me by the author Cameron C. Taylor, and is an excellent read (I'll be doing a review shortly). The chapter below is on choices and consequences, and was an especially good one. I thought I'd share it here with the author's permission. While speaking at a prison to a group of the inmates, I asked for a volunteer from the inmates to describe his dream life. After a long pause and some prodding, one of the inmates began to speak. I was rather surprised by his vivid description of a successful career, a beautiful home, and a loving, happy family. I continued, “What if you don’t want to get burned? Can you just choose to touch a hot stove and not get burned?” He, of course, answered no. I then taught that we can choose whether or not to touch a hot stove, but we cannot decide whether or not we get burned. We can choose our actions, but we cannot choose the consequences of our choices. Getting burned is a natural consequence of touching a hot stove just like a prison sentence is the consequence of being involved with illegal drugs. I replied, “Why are some people physically fit and others overweight?” I explained that people’s health differs because they have made different choices. Consider someone with a lot of money who is also overweight. This person has learned to live financial laws but does not live the laws of health. Something similar could be said about someone who is in great shape and is poor. They have learned to live the laws of health but not the laws of wealth. The great news is that you can be successful in all areas of your life by living the divine laws related to each area. In response, I asked the inmate to climb on the table he was sitting at and I climbed onto the table at the front of the room. I then said, “On the count of three, jump off the table. One, two, three.” We both jumped off the table and hit the floor. I continued teaching that the law of gravity affected both of us the same regardless of age, gender, race, or upbringing. This is also true of the laws of success. They are the same now as they were in the past and will be the same in the future. Our knowledge about these laws may fluctuate, but their principles and application will never change. Anyone can be successful, because anyone can learn and follow the laws of success. God has blessed all men with liberty. This great freedom of choice is what determines who we will become. All men are born equal but become unequal as they make decisions. Every man chooses to obey laws differently. One may choose to play softball while another chooses to build a business. One may choose to turn on the television while another chooses to read books. One may choose to golf on his day off while another chooses to spend time with his family. One man chooses to listen to the radio on his way to work and another man chooses to listen to positive tapes. We are born equal, yet years later live diversely, all because we chose to live divine laws differently. It is really very simple. Following divine laws results in positive outcomes. Years later, I was at a chamber of commerce meeting and recognized the inmate I had spoken with at the prison. He approached me and said, “Thank you so much for visiting me in prison; your message changed my life. I always wondered why some men had great lives while mine was miserable. I saw people with successful careers, beautiful homes, and happy families and wondered why my life was just the opposite. Last Edited: 31st July 2017 The content of biblemoneymatters.com is for general information purposes only and does not constitute professional advice. Visitors to biblemoneymatters.com should not act upon the content or information without first seeking appropriate professional advice. In accordance with the latest FTC guidelines, we declare that we have a financial relationship with every company mentioned on this site. Thanks for the informative post.. and thanks for adding our comment to the blog. I am subscribing to your feed so I don\’t miss the next post!